I love visiting local cemeteries in Abilene after Allhallowtide, the Christian triduum comprising All Hallows' Eve (October 31), All Saints' Day (November 1) and All Soul's Day (November 2). I like visiting the local cemeteries because you can experience the way Allhallowtide is commemorated among our local Hispanic population with their unique cultural expression--Día de Muertos, the "Day of the Dead." The Day of the Dead celebration involves remembering family and friends (and even pets!) who have died. It is a festive time of remembrance. If you have Hispanic or Mexican neighbors in your city you've likely seen the festively colored and decorated skeletons and skulls that are a part of the Day of the Death celebrations. 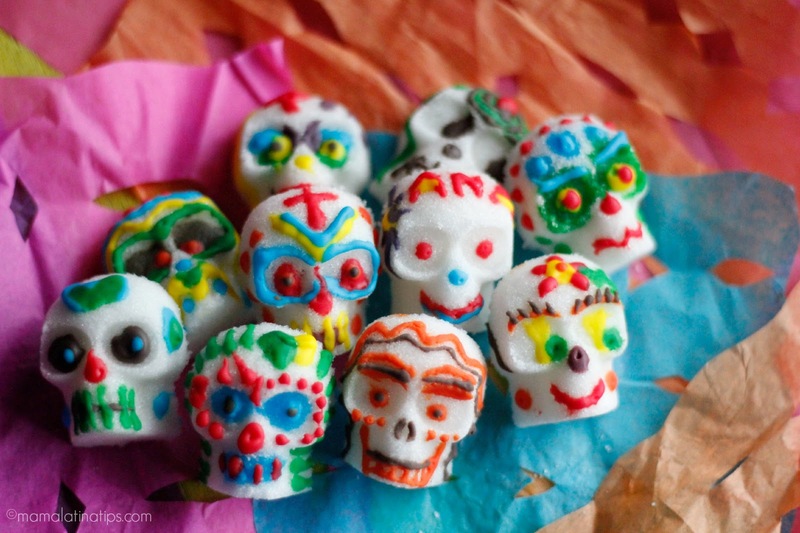 These decorated skulls--especially in candy form--are sort of the "Easter eggs" for the Day of the Dead. Personally, I adore these festive skulls and skeletons. It's one of my favorite things about Allhallowtide in Texas where we have a lot of Hispanic friends and neighbors. At the Beck house in our "living" room we have a few Día de Muertos skulls set out as year-round decorations that peek out at you. If you look for them. As a part of the Day of the Dead remembrances Hispanic families will go to the cemetery to decorate the graves and to leave gifts for their departed loved ones. Which is why I love Texas cemeteries this time of year. How colorful they are. Well, colorful in the Hispanic sections. It's quite a contrast. After Allhallowtide the White parts of the cemetery look the same as they always do, very little decoration or flowers. But the Hispanic parts of our cemeteries? They bursting with color during the three days of Allhallowtide. And, truth be told, this color a year round thing. Cemetery visitation and decoration is a rich part of Hispanic culture. Not so much with us White folks. Here's one of my favorite examples of this. This is my favorite spot in the Abilene Municipal Cemetery. In the Hispanic part of the cemetery there is a small wood-framed and stuccoed tomb. That in itself is unique as the family, I'm assuming, didn't have enough money to build a stone tomb. I've never seen a wood-framed tomb in city cemetery. But the stucco has the unique advantage in that it can be painted and decorated. All around this tomb are bright paintings of Hispanic Catholic spirituality. Juan Diego and Our Lady of Guadalupe. Madonna and Child. The Sacred Heart of Jesus. The Man of Sorrows. St. Joachim and St. Anne. The tomb is one huge icon. Since I was in Mexico on Friday and Saturday, I couldn't help but reflect on how the church in our culture has lost the connection with loved ones who have gone before. Wish we still had graveyards next to our church buildings!